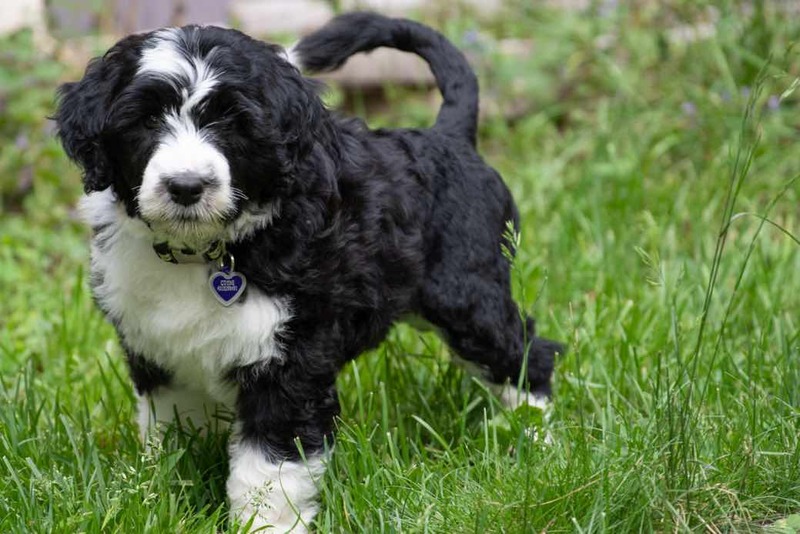 Thinking of buying or adopting a Portuguese Water Dog? 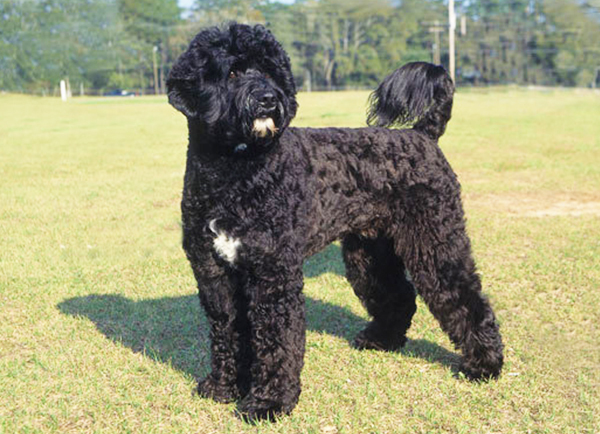 The Portuguese Water Dog is a large breed, longer than it is tall with a well-balanced and robust overall appearance. It is characteristically a very energetic and intelligent breed and one of the few dog breeds with enormous swimming and diving abilities. It features a large but well-proportioned head with a muzzle that tapers vaguely to a broad nose with wide open nostrils. The colour of the nose depends on the colour of the coat (black nose in black, black and white, and white dogs, liver nose in brown, brown and white, and brown dogs.) It has round, widely set eyes that are either black or dark brown in colour, complimented by dark eye rims. The heart shaped ears are set above eye level, hanging close to the head. The upper teeth closely overlap the lower teeth and set squarely to the jaws (scissor bite). A short but strong-muscled neck carries the broad head proudly. The body sports a wide and deep chest, short back and tucked-up belly. The Portuguese Water Dog also features straight, well-muscled forelegs and hindlegs with round, flat, and webbed feet cushioned by very thick pads. It has a thick tail that tapers which is customarily clipped leaving a plume at the tip. It has a profuse single coat that comes in two distinct types: wavy (long with slight sheen) and curly (short, harsh and dense). The coat is normally clipped in either “lion clip” (muzzle and middle torso to the tail are clipped) or “retriever clip” (entire coat is trimmed to show the shape of the dog.) The coat comes in a variety of colours including solid black, pure white, various shades of brown, black and white, and brown and white. 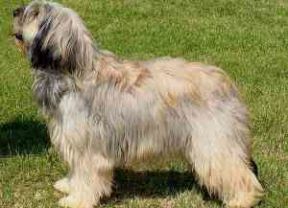 The breed dates back to as early as the 1500s and has its origins in the province of Algarve in Portugal brought there by early settlers. There are some speculations that the Poodle played a role in the development of this breed, given the fact that both breeds share similar characteristics. The Portuguese Water Dog (known as “cao de agua” in Portuguese) was originally developed to be a “water dog” that aided the fishermen in various tasks. It was involved in retrieving broken nets, sending messages between boats, retrieving bits and pieces that fell overboard, and guarding the boats when docked. It was even known for herding fish into the net as well as rescuing fishermen in the water. With the advent of new technologies and modern fishing practices, the need for the dog’s services diminished and so almost did the dog. 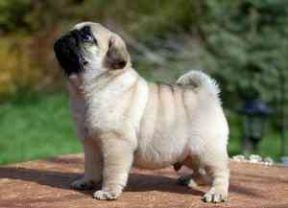 In fact during the 1970s, there were as little as 25 of these breeds left worldwide! Luckily, a rich shipping tycoon by the name of Vasco Bensaude showed great enthusiasm in the breed. Through his efforts, a breeding program was started and a breed standard was created for the Portuguese Water Dog. 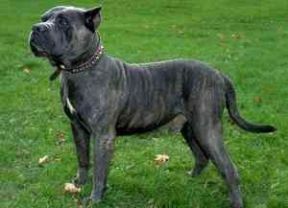 Although still considered a rare specimen, the popularity of the breed continues to grow and is gradually becoming a common family pet in many homes in mainland Europe, United States and the United Kingdom. The Portuguese Water Dog is an excellent household companion. It is intelligent, loving, and very obedient. It is fairly sensitive to the tone of the human voice and is highly trainable. It has a playful attitude which makes it excellent with children, though it will not typically obey a child as it will treat a kid its equal. It has a pleasant and stable temperament and is generally good with other dogs and household animals, especially those it grew up with, but it may get jealous of other pets. Its instinctive working character is manifested by the dog’s attitude of being at close proximity to its master all the time, usually following its master indoors and outdoors. The Portuguese Water Dog loves to be engaged in activity and may have a tendency to be destructive if it becomes bored. It also has a pleasant disposition, courageous, tireless, and always determined to defend its territory which makes it an excellent guard dog. Although it is not prone to excessive barking, it has a very loud, distinctive bark and a loud, irregular, breathy pant that sounds like an audible “laugh” when the dog is playing or greeting someone. Training the Portuguese Water Dog is not difficult. It is a fast learner; quick to understand instructions and quite sensitive to the tone of voice. It is an intelligent breed and training calls for a consistent, planned and constructive approach. To keep boredom from setting in, alternate training and play. This breed is a notorious chewer and will chew on almost anything that it can lay its teeth on. Keep it busy with heavy-duty chew toys. This working breed has a tireless energy and will most certainly enjoy nice long walks, a session of play in an open and safe environment, or a chance to swim and retrieve. It is suitable for an apartment living provided that proper exercise is given. It can also tolerate living in an outdoor environment with temperate climates. However, it will do best in a home with a fenced yard or with an outdoor-oriented family. The coat requires regular brushing and combing (preferably every other day) to avoid matting, as well as monthly clipping but show dogs need more extensive grooming. If a dog is taken for a swim, make sure to check and clean the ears afterwards. Since the Portuguese Water Dog is a “fisherman’s friend,” it is well-adapted to a diet of salt-water fish and other marine edibles. 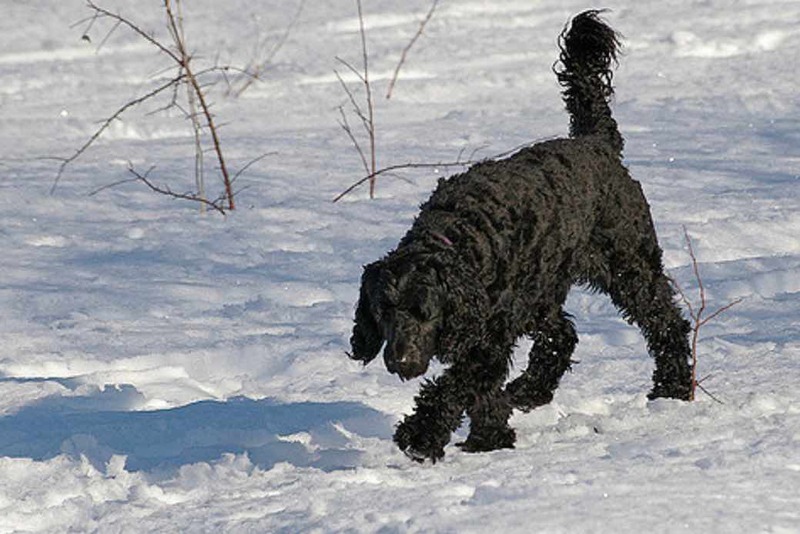 The Portuguese Water Dog is a hardy and robust breed with a lifespan of 10 to 14 years. As with most canine breeds, the Portuguese Water Dog is also susceptible to certain hereditary medical predispositions. 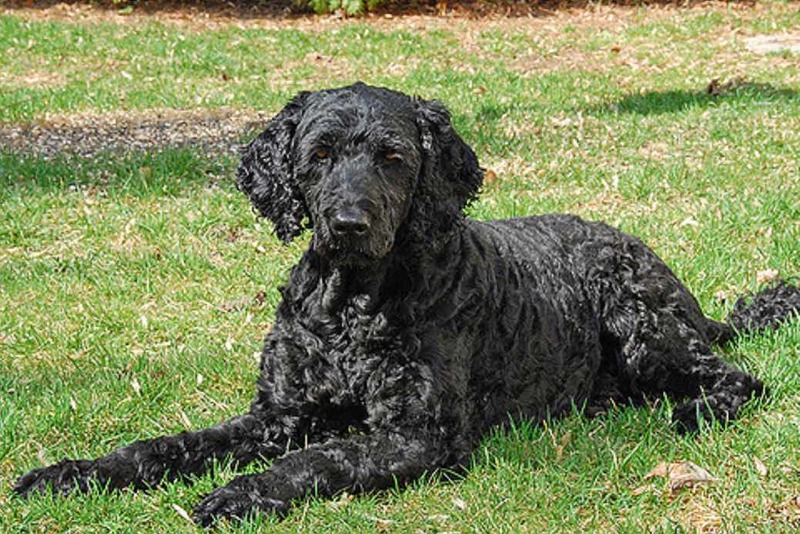 Like Poodles, this breed is vulnerable to hip dysplasia, progressive retinal atrophy and cataracts.